The Poverty Roundtable Hastings Prince Edward has announced its 2017 Community Champions. The award recognizes those who have meaningfully and intentionally championed poverty reduction work or implemented practices or protocols to prevent or reduce poverty working toward increasing standards of living to meet physical, social, emotional and spiritual well-being. This is the first year that the award has been presented. The award was presented at the Poverty Roundtable’s quarterly public meeting March 20. Monica Piercey and Jay Gizuk of Bancroft, and the Loyalist Training and Knowledge Centre for their Elevate and Elevate PLUS program were recognized. 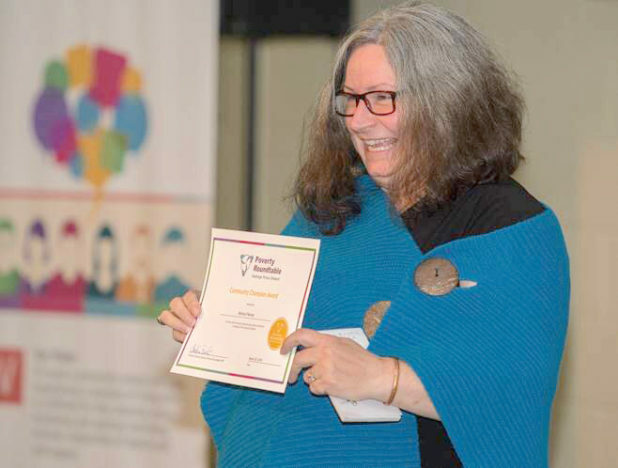 “Monica Piercey was selected for her dedication to her community, for bringing people together to share resources, ideas, and to reduce and break-down barriers and for her continuous work organizing the North Hastings Community Trust Wood Share program, a collaborative community program that increases access to emergency firewood,” said Tanya Dutton, community engagement co-ordinator for the roundtable. The Elevate Plus program aligns skills training and pre-employment preparation with employers’ needs by supporting partnerships that bring together sector-specific employers with relevant employment and training providers. Recipients were selected based on criteria such as dedication and intention in their efforts to improve the lives of people experiencing homelessness or in need of affordable housing, investments in community to ensure it is inclusive and/or enhancements to community belonging and inclusion through community actions and/or community education.